Costas Baltazanis has twenty-five years of teaching experience. He has taught a great number of students in private or group classes. His students are today’s professional players and teachers all over Europe and Usa. In 1991, Costas started teaching Guitar and Harmony Courses at Ph. Nakas Conservatory in Athens, Greece. Later, he taught Ear Training, Jazz Composition, Ensemble and Improvisation Courses. In 1995, he became Head Director of the Modern and Jazz Music Department. He organized a big number of festivals, contests, workshops, seminars, lectures, guest musicians’ concerts, teachers’ and students’ concerts. He supervised the Berklee College of Music “Study Abroad Program” at Ph. Nakas Conservatory, the Student Exchange Program between the two Institutions and the Four Semester Academic Program (for students who would get their first two years Berklee College credits in Athens ). He also, gave lectures and seminars at conservatories in all the major cities of Greece. In 1996 and 1997, Costas Baltazanis was invited by Berklee College of Music to teach and give concerts at the Guitar Department. In 1998. He took part along with Berklee Professors in Blagoevrad Jazz Festival, Bulgaria conducting performances, seminars and scholarships. In 1999, the same team of teachers performed and gave seminars in Cyprus. 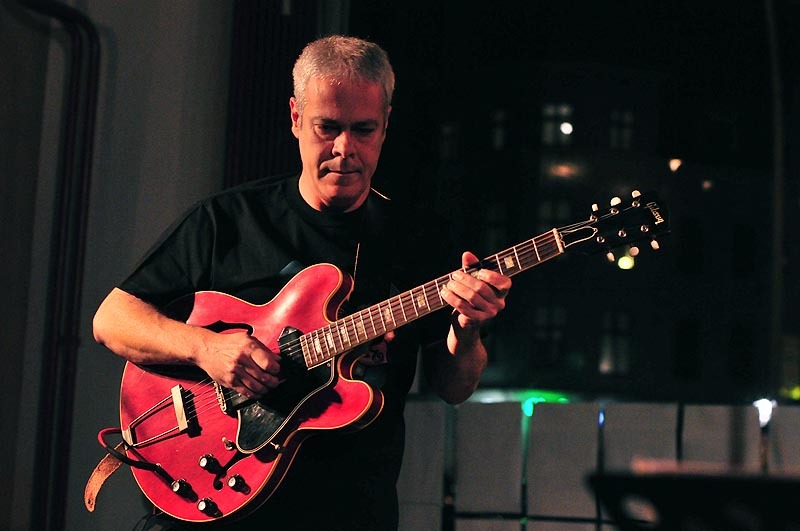 Later that year, Costas traveled to Helsinki, Finland as a member of the Berklee College Scholarship Committee and gave lectures at ‘Pop and Jazz Conservatory’. In 2000, a similar kind of event took place in Barcelona, Spain, where he taught at ‘L’ Aula del Liceu’. In 2002, Costas traveled to Tel Aviv, Israel as a guest teacher at ‘The Rimon School of Jazz and Contemporary Music’. Costas has been giving lectures on topics like: ‘Jazz Improvisation’, ‘Super imposed Harmony’, ‘Triadic improvisation’,’ Modal Improvisation’, ‘Teaching Jazz’, ‘Psychology while playing and practicing music’, ‘Odd Meters in Greek and Balkan Folk and how to use them in Fusion and Jazz’. Costas Baltazanis has written three books: ‘Music Theory and Ear Training’, ‘Jazz Harmony’ and ‘Electric Guitar’, published by Ph. Nakas Editions and taught in universities and music schools throughout Greece. From 2009 -20012, Costas Baltazanis had been the Director of Studies at ‘Momi Music School’ in Athens, Greece.